My Life with Bob: Flawed Heroine Keeps Book of Books, Plot Ensues – loudlatinlaughing – Euge! Euge! This is the type of book that gives me nightmares. It hovers in mediocrity with brief flashes of insight, and my greatest fear is that my own writing falls into this tepid category. I’d rather not be published than to be allowed to put something like this out. 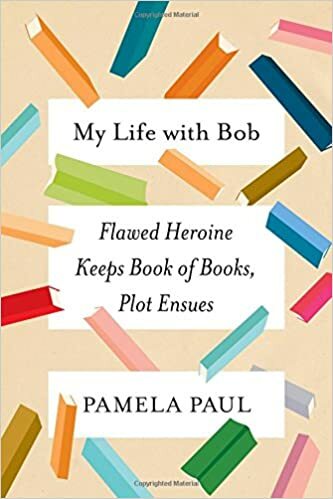 The book has every indication that it’d be up my alley—it’s a book about her (Pamela Paul’s) lifelong journey through reading, centered on a notebook she’s kept from 1988 where she enters the book titles she’s read. Sounds familiar, but she abandoned the idea of recording her thoughts about the books and only lists titles. Is that really useful? Unfortunately, the flaccidity of the story proves that it takes more to being a solid writer than hoovering up books for decades. There goes my lifelong preparation, guess I’ll have to start pushing the pen across the page instead. We have several things in common—a likelihood of mispronouncing words we’ve only seen in print, dubbed “mumblenyms” by Liesl Schillinger); the realization that the more you read the more you realize remains to be read and the more that you’re aware of not having scratched the surface; the fact that being told “you should read this book” is never as simple as it sounds (and most likely not advice to be taken). She’s the editor of the NYT book review, the only part of the Sunday Times that I immediately recycle, which should have been a red flag for me and made me avoid this book. Alas.